The art historian Paul Vandenbroeck has conjectured that the abstract, formless boucherouite patterns (which are typically designated for the most private rooms of the home) are linked to notions of fertility, gestation, irrigation and potentiality. ‘The “rotting” shapelessness is here no decline into decomposition,’ he writes, ‘but fermentation into form.’2 The fixed, logical structure of the warp requires the intuitive, fluid and irregular fibers of the weft to bind it, just as social cohesion relies not just on the higher functions of order and regulation but also the intimate, unruly and inchoate life forces of the heart and home. The textile panels created by Margo Wolowiec depend on a similar push and pull between order and chaos, between the life of the mind and the work of the hand. 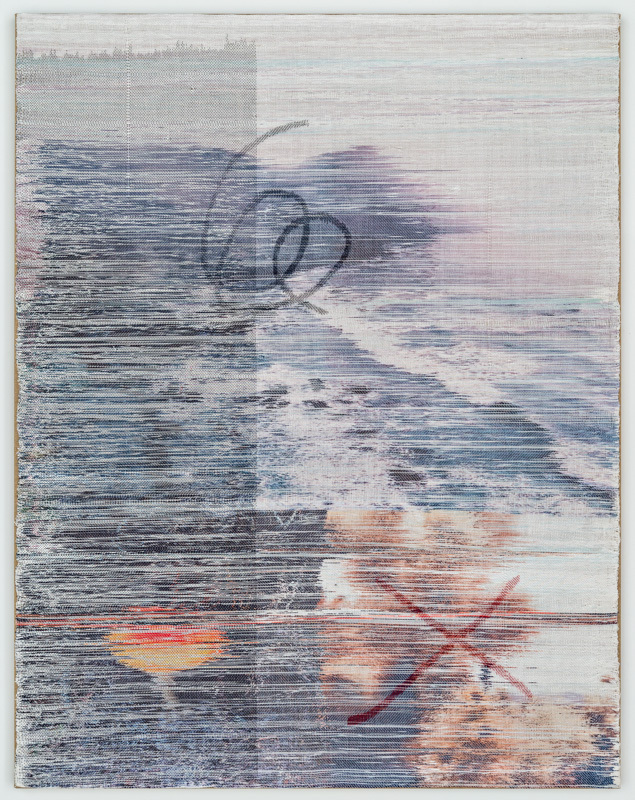 Wolowiec prints digital images, scooped from the seemingly limitless sea of online media, onto partially woven polyester threads; she then unravels the threads and re-weaves them into textiles of her own devising. This reconstructive process allows her an extraordinary command over the surface, as if she were reassembling the very pixels in the original Jpeg file. By drawing the weft threads (on which the image is printed) through the warp at diferent alignments, she can abstract her source material to the point of breakdown. While the finished images might appear degraded or corrupted – as though gusts of white noise have blown through them – they are in fact meticulously controlled by the artist. Tugging in the opposite direction to this decidedly manual process are the source images in Wolowiec’s work: Jpegs found predominantly – though not exclusively – on Instagram. These images belong to the world of desire, of imaginative projection and an idealized depiction of reality. Aside from the various Instagram filters available to further abstract a photograph, the infinitesimally subtle degrees of fictionalization that a subject undergoes before it is composed, captured (likely on a smartphone), uploaded instantly to the cloud, cropped, tagged, posted and re-posted, are innumerable. For many users, Instagram is a form of dreaming, as detached from lived experience as are the spectral visions of the unconscious mind. Except, of course, that unlike dreaming, social media platforms are not only public but actually, to a great extent, radically accessible to the corporations who own and maintain them. The individual production (or reappropriation) of content on Facebook and Instagram may feel, to the user, like a singular, intimate activity but, from the perspective of the platform provider, it constitutes just a miniscule grain within a mass harvest of data that feeds an overarching superstructure of analysis, control and capitalization. Our ‘sharing culture’ is, in certain respects, not about sharing at all but about the surrender of what was once most highly valued – the personal and the private. It is significant, therefore, that once images are processed through Wolowiec’s loom, they are rendered more or less illegible. They become private again. The efect of her re-weaving has a parallel in the corruption of Jpeg files when they are incompletely downloaded or miscopied. Abstraction occurs in transit, when an image file is transferred from one location to another – a satisfying metaphor for the appropriation and de-contextualization of images. In some cases – as with works such as Becoming north northwest or A twenty percent chance (both 2015) for which she gathered images solely by their GPS data – Wolowiec’s selection process is itself a form of abstraction. Another series of works featured only pictures of hands holding objects, regardless of what the objects were. One of the GPS locations she chose was Joshua Tree, in the Mojave Desert, a place in which the rigidity of the imposed cartographical grid is subverted by the freedoms available to those who choose to live their lives within its remote topography. Abstraction, in Wolowiec’s work, is a bid for an unregulated space at the junction of the political and the social, the rational and the subjective, the conceptual and the intuitive. Throughout Modernism, abstraction has scandalized conservative culture by appearing to flirt with its close cousin, error. This is partly why the imprecision of the Impressionist brushstroke, or the Surrealist embrace of chance and accident, are so arresting: because they challenge conventional distinctions between artistic intention and mistakes. It is useful to think of those transgressive boucherouite rugs in this light – deliberately enacting fallibility – and of the intellectual and afective space that is accessed by formlessness. (This territory has been famously mapped by Yves Alain Bois and Rosalind Krauss, who developed Bataille’s theory of l’informel to encompass the artistic modes of horizontality, entropy, abjection and carnality.3) Wolowiec takes the brittle, predetermined visual data of social media, and rehumanizes it through the delicate inconsistencies in her manual weaving process. In many works, Wolowiec also appears to slash great crosses, or looping squiggles, over her appropriated imagery. In fact these gestures are painted onto the warp threads before weaving takes place, so they retain their alignment but are recessed in tone beneath the colored threads that traverse them. In a piece such as 8192015_at_0451pm (2015), in which she convenes a grid of several images and crosses two in particular, it is apparent that her gestures hark back to the now obsolete photographic practice of marking up contact sheets for printing. Ironically, in this process, it is the best images that are the ones defaced with the photographer’s crosses. Wolowiec’s vocabulary of interventions has expanded to also include loops, dashes, and scribbles; the efect is to add to her dense surfaces yet another layer of carefully inscribed manual flaws. Some of the shakier gestures also recall the erratic line of early computer graphics programs, in which the mouse proved to be a pathetically inadequate proxy for the pen. 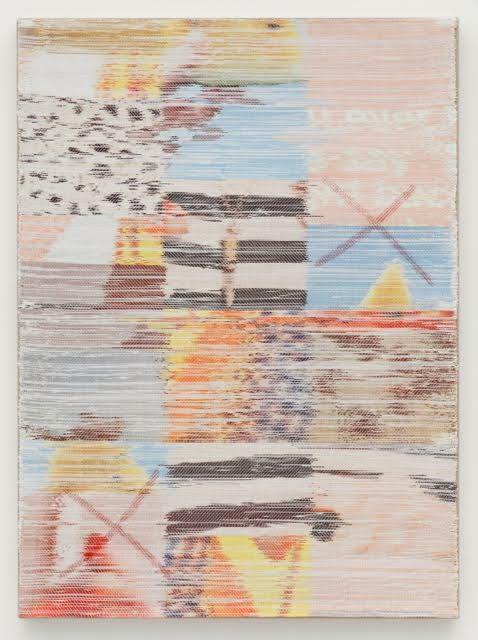 Marking her weavings in this way is, in a sense, a means for Wolowiec to touch the immaterial, as if she were confounded or bewildered by the inefability of her source material. Her weavings insist on the integrity and primacy of the hand, as if in doubt.